As predicted yesterday, former Fiji military commander and minister in Fiji's interim government, Ratu Epeli Nailatikau, has this morning been appointed Vice-President of Fiji. 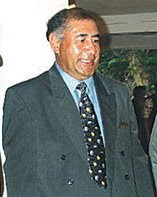 Ratu Epeli, a former Speaker of the House of Representatives, was Minister for Indigenous Affairs in the existing interim government led by Prime Minister Commodore Voreqe Bainimarama. Fijilive reports that his appointment, made a short while ago at a swearing-in ceremony at Government House, is under the eighth decree issued by President, Ratu Josefa Iloilo following the abrogation of Fiji's 1997 Constitution last week. Appointments to the positions of President and Vice-President were traditionally made by Fiji's Great Council of Chiefs. The website says the position of Vice-President became vacant after the military takeover of December 2006 and was previously held by Bau chief and lawyer Ratu Joni Madraiwiwi. Ratu Epeli was army commander from June 1982 until May 1987 when Sitiveni Rabuka staged the first coup as the 3rd highest ranking officer. He was also Ambassador then High Commissioner to London and former Speaker of the Lower Hose from 2001 to March 2006. He was rejected by the GCC as VP nominee in April 2007 following which the GCC was suspended and basically dissolved. *There's no word on the other appointments Coupfourpointfive was told about yesterday. Finally, the Nailatikau nit-wit has sworn himself to treason. That's only natural because the goon belongs in jail! Nailatikau is the best man for the job. Its the Qarase govt that belong in jail with his nitwits. If it wasn't for the army commander taking control, Fiji would have gone to the dogs by now and racism would have been rife. Its good to have the facts right before coming onto forum. And NZ should see to its own problems of lawlessness and violence before picking on Fiji.AT least with the army in control- violence has subsided and Fiji is far far safer than NZ today. Beggers arn't choosers. a dying amn may clutch at a straw. It is about Time NewZealand look at its own back yard first , Crime , guns , road rage , no respect for seniors , teachers to name a few . Fiji is very safe and withe blessing of the lord , will pull through . Stop BULLYING , Look at the positive side and lend your help by listening because at the moment you have lost your listening skills . The PM of Fiji is a very nice person and one who wants equal rights for all people of Fiji . God Bless Frank Bainimarama . You saved us from the last Coup ( GeorgeSpeight ) and put Qarese in power , not realising Qarese was also part of Speights gang .